Hop aboard the MV Supercat catamaran for either a 1.5 hour Weekend Cruise or a 2 hour Weekday cruise to see Sydney Harbour transformed into a winter wonderland! Our Vivid Light Festival cruises will allow you to enjoy a colourful light playground featuring 3D projections, interactive art sculptures and illuminated skyscrapers. Not only are prime views of the VIVID light show part of your experience, but all your beverages are included! The complimentary drinks include: sparkling, beer, wine, soft drink or tea and coffee. An amazing light show, refreshments, sights and sounds; it’s all yours with this Vivid Light Festival cruise event that’s got to be on your calendar of things to do in 2019. Share the Excitement of Vivid with Sydney Event Cruises! As tickets will sell out fast for this amazing cruise, don’t miss out. Book now online. Please allow plenty of travel time as Sydney Event Cruises is not responsible if you miss the boat. 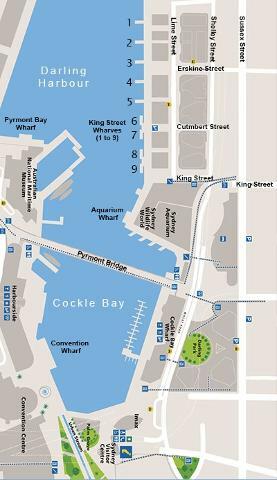 Boarding Sydney’s MV Supercat cruise boat on weekends at 5:30pm, 7:30pm or 9:15pm or on weekdays at 5:30pm or 8:00pm on a selected date between May and June 2019, you’ll depart via King Street Wharf, Darling Harbour, setting sail on a spectacular Harbour cruise that’ll allow you to take in the best sights our fabulous Sydney Harbour has to offer during the Vivid Light Festival. 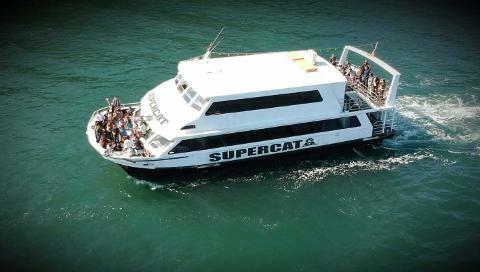 If you’re after comfort and an uninterrupted view then look no further, as the MV Supercat is licenced to carry 300 passengers but we are capping each cruise event to 200 passengers per cruise. Plus, all children under 3 years cruise for free..
WHARF ALLOCATIONS NOT RELEASED AT TIME OF PUBLICATION –WEBSITE WILL BE UPDATED AND PASSENGERS WILL BE NOTIFIED VIA EMAIL ONCE ANNOUNCED.